you. 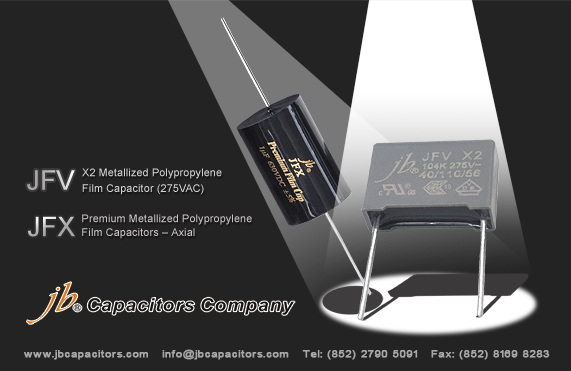 Welcome to try our capacitors and let us know your thinking. Project: Upgrading a CD players Rotel RCD955AX. 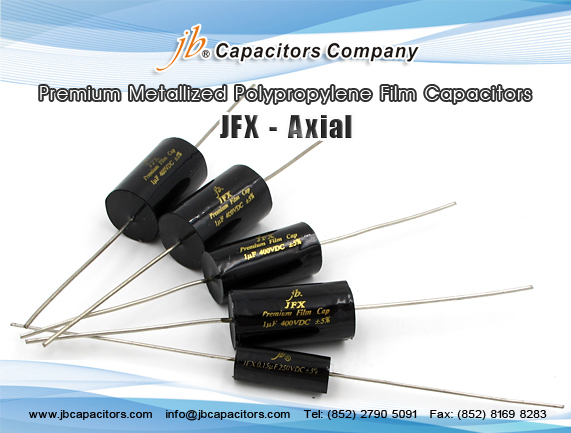 This is just a short letter to say thank you for the capacitors which arrived safely and my feedback having now installed the JFX Premium Polyprolene film capacitors in my Rotel RCD 955AX CD player as part of a series of upgrades to the player. Here they are installed in my CD player. They replaced two Blackgate F series electrolytic’s. Bigger than the Blackgate originals, but very easy to fit as legs were same diameter as Blackgate’s so they fitted through the pcb holes with absolutely no problems. Aesthetically they look really nice and match very well with the remaining Op Amp decoupling Blackgates. 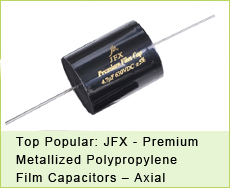 Replace all power supply capacitors with Panasonic FC. 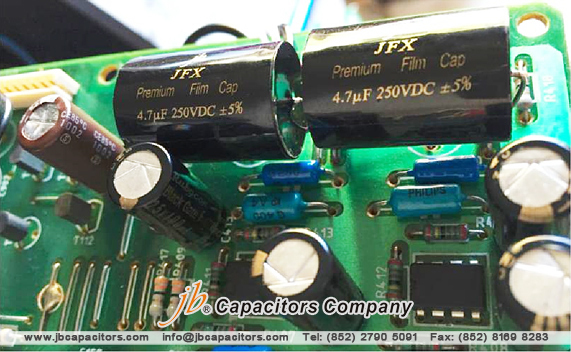 Replaced all Transport, Filter, Decoder, DAC capacitors with Panasonic FC. 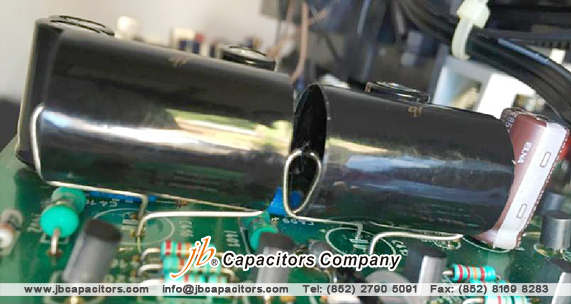 Replaced all DAC Decoupling capacitors with Wima MKS series. Replaced Op Amps for HiFi audio grade from Texas Instruments. Isolated Filter chip and gave it its own independent regulated +5V power supply. Performed Filter Non Oversampling Modification. 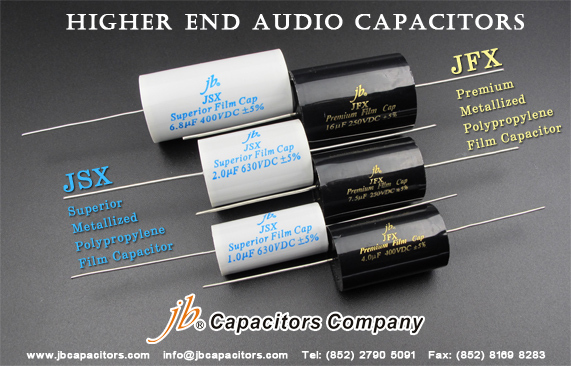 Replaced final audio output DC decoupling Blackgate F series capacitors for JFX Premium. I am very happy with the improvements bought with all the mods I made. So happy in fact I removed my Naim CD5i II CD player from my system which sounds considerably less good now and am keeping the Rotel in its place instead ! 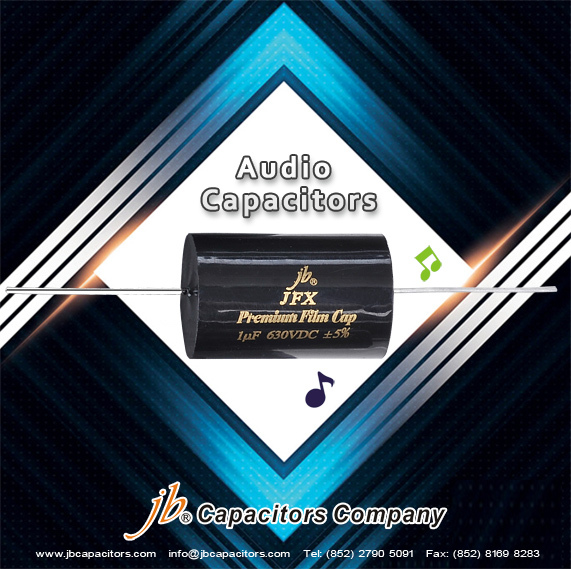 After then installing your JFX Premium capacitors the sound has opened up a little more and vocals seem to have slightly more but very clean treble. The noise floor is very low, which gives way to a very wide dynamic range probably why it seems the treble has increased slightly. Whilst is still early days, each time I play a CD the sound does seem to be improving with time, not huge differences, just more of the same clearer, wider, more dynamic. If the capacitor could be made a little warmer sounding would be ideal for CD replay. 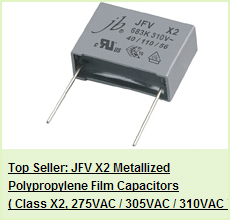 After nearly 2 weeks running of our JFX capacitors, I am pleased with the performance of the capacitors and have since we last communicated installed a very low jitter clock with its own dedicated power supply to replace the simple crystal clock in the CD player. This bought an immediate noticeable warmth and smoothness to the sound. 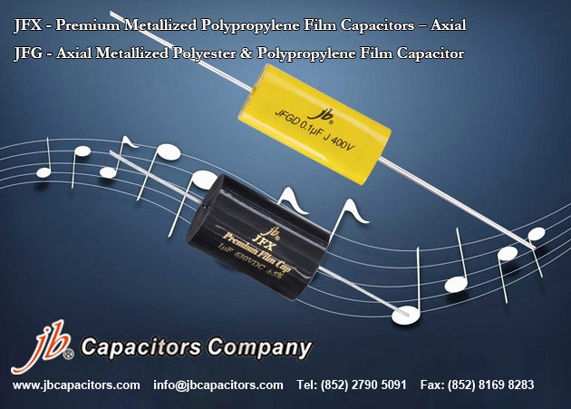 So looks like your capacitors were always warm and rich sounding but the CD Player as standard wasn't allowing them to perform at their best ! 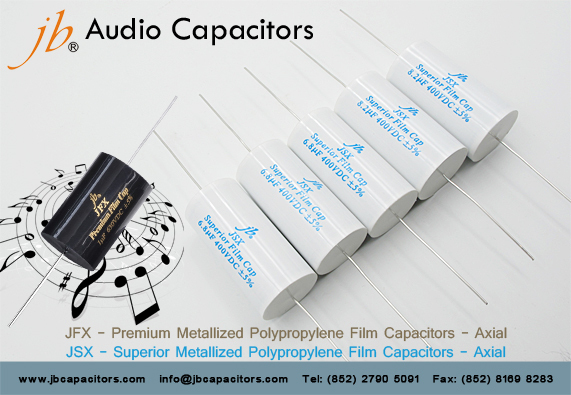 Overall I am very happy with the quality of your product, service and delivery and have no hesitation in recommending to anyone seeking a sensibly priced, but high quality alternative to the usual well known, but in comparison can be very expensive American and European audiophile capacitor brands ! 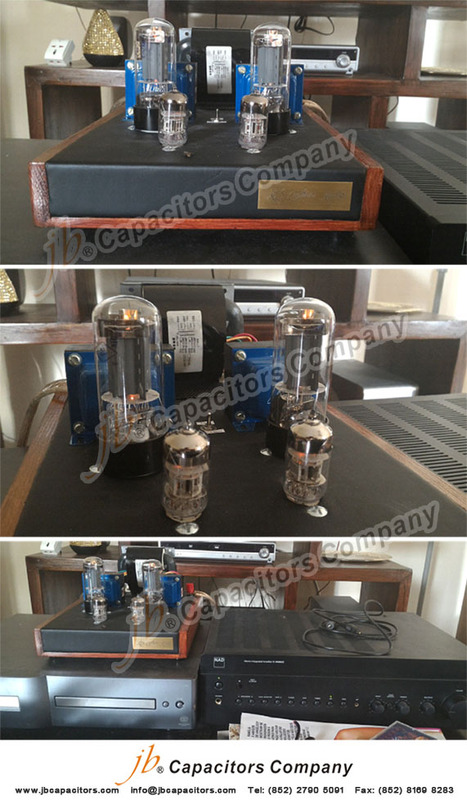 Hi Lilian, Our last amplifier was very well received and JB played a big role in this result. 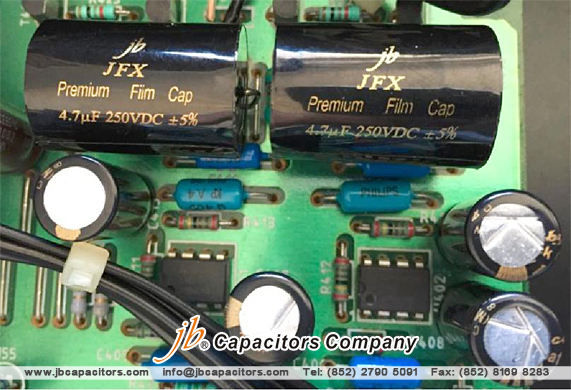 We tested several capacitors and chose to use the JFX in 2 parts of the amplifier (220nF and 330nF) and the X2 capacitorsin the grounding section. We are delighted with the quality of them all. I send you some photos of our lastest amp during a demonstration last August. Nov.11th, 2013 (11/11, Singles Awareness Day) has been an historical moment in taobao Tmall with a business record of more than 36 billion RMB. Everyone is astonished by this number. So do I. One the other hand, we have to admit that more and more people prefer to order things online. One click, one order. Internet makes life simple and convenient. 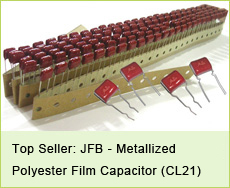 We jb Capacitor Company also has interests to join the journey of online shopping. However, we pay much attention on overseas market. Please visit our online store by click below link. We welcome your order and share your shopping experience with us. jb just your best choice. 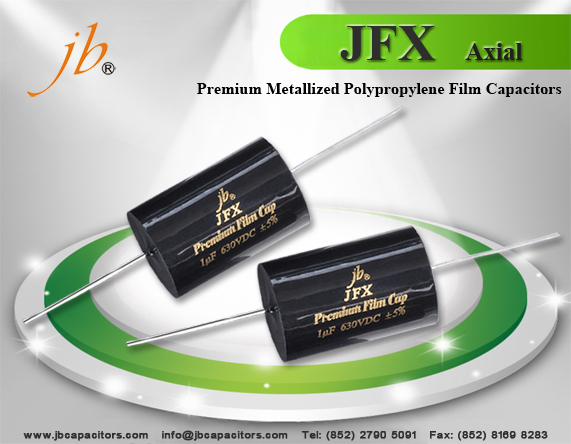 jb JFX also called Premium Metallized Polypropylene Film Capacitors, its features has excellent sound performance, specially used for high-end audio products, very low dielectric absorption factor, very low dissipation factor, ect. 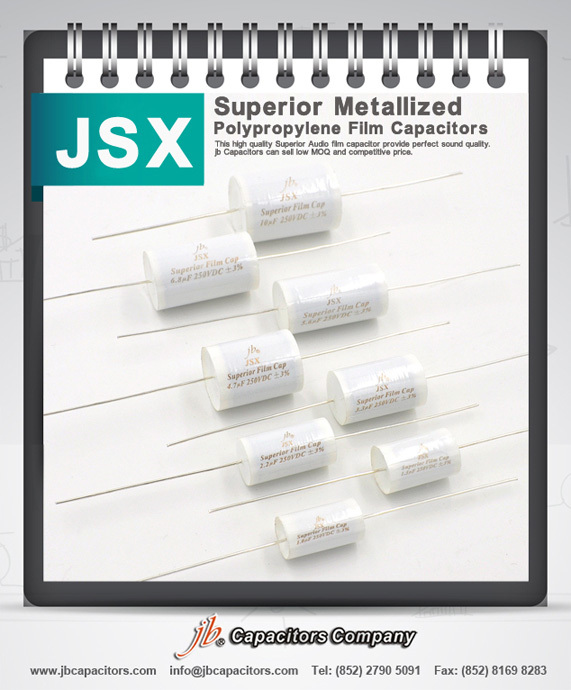 Because JFX capacitors can display signs of a near perfect capacitor, therefore, it widely used for amplifier, loudspeaker, cross-over, juke-box, high frequency network, high-red ham radios, etc. 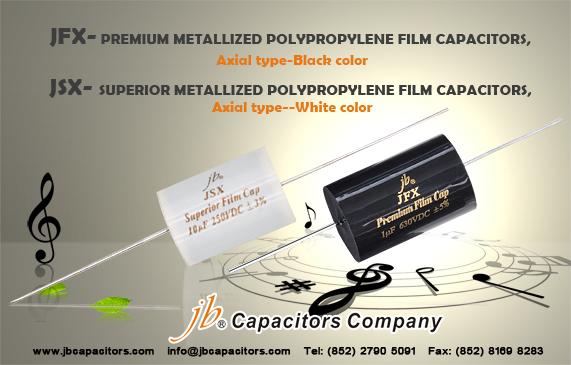 If you buy this product, i believe that jb JFX caps will allow your music to be accurate and uncolored in every way.